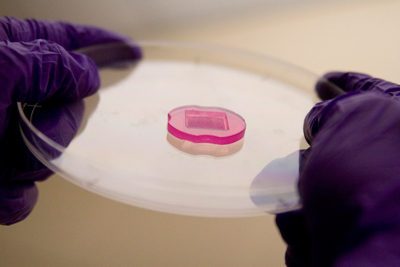 Learn More — 3D Petri Dish by Microtissues, Inc. The 3D Petri Dish® is the natural 3D cell culture environment that is scaffold-free and that maximizes cell-to-cell interactions. Make hundreds of spheroids of uniform size in a single pipeting step. Image an array of spheroids on the same optical plane. Form spheroids of two different cell types. Grow spheroids from single cell clones. Harvest spheroids for RT-PCR and Western Blots without enzymes. Form microtissues in complex shapes for novel applications. When cells are seeded onto the 3D Petri Dish®, cell-to-cell adhesion drives the self assembly of the 3D microtissue, typically in 1-2 days. No synthetic scaffold to alter cell physiology, no variability due to ill defined gels, no animal products. 3D cell culture in a format suitable for high content microscopy that has worked with over twenty different cell types both primary cells and cell lines.